Team-based care is a collaborative process among primary care providers (PCPs) and other clinicians who deliver aspects of care but do not function as PCPs (eg, nurses, pharmacists, and social workers). Effective teams, with a mix of PCPs and non-PCP clinicians, leverage the skills and full scope of licensure of each member, allocating the most appropriate personnel to specific tasks.7-9 Expanded roles for non-PCP clinicians are essential for the delivery of high-quality primary care.10-18 Study findings suggest that a portion of PCP tasks could be reassigned to non-PCP team members19 and that non-PCPs, such as nurses, can independently meet the needs of some patients during clinic visits.20,21 Not surprisingly, the utilization of clinicians other than physicians to manage patient care appears to be more common among clinics at higher levels of PCMH functioning compared with those at lower levels,22 and underutilization of non-PCPs is an identified barrier to PCMH implementation.23 Although studies have assessed care delivery among PCP roles,24-29 less is known about non-PCP care delivery, especially in the context of the PCMH. Moreover, little is known about whether there are shifts in patterns of care delivery among members of the care team that may be attributed to systematic uptake of new care delivery models. In April 2010, the Veterans Health Administration (VHA) introduced a PCMH initiative called Patient Aligned Care Team (PACT) to more than 900 primary care clinics nationwide.30 Under PACT, care is primarily delivered by members of a core team, including PCPs and nurses, and further supported by members of an expanded team, such as pharmacists and social workers. 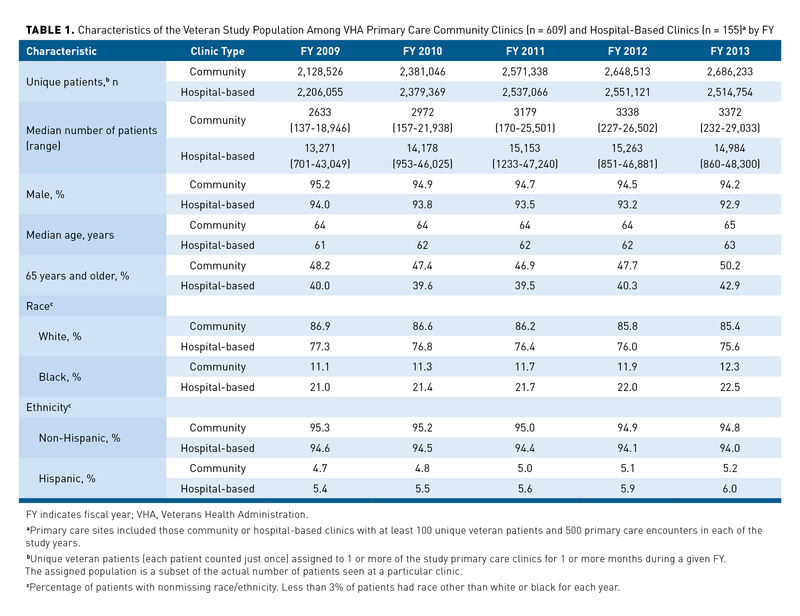 During the rollout of PACT, VHA increased its primary care support staff by more than 3000 full-time equivalent employees, which included the hiring of almost 1300 registered nurses (RNs).31 Rosland et al31 reported decreases in quarterly patient visits with PCPs and pharmacists from 2009 to 2012 (from 53 to 43 and from 2.6 to 2.4 per 100 patients, respectively; P <.01 for both trends), whereas visits with nurses remained unchanged. An analysis of visits by the full complement of non-PCPs was not reported. Expanding on this initial work, we conducted a longitudinal study to examine trends in patient encounters with a full range of PCPs and non-PCP clinicians in VHA primary care clinics. The purpose was to develop an overall metric that could be sensitive to changes in care delivery models and reflect care by all clinicians. Our aims were to (1) identify and measure clinician-specific care delivery trends in primary care clinics via documented patient encounters and (2) determine whether the identified clinician-specific care delivery trends could reveal a change in care delivery model (ie, PACT implementation). This study was approved by the University of Michigan and the Veterans Affairs Ann Arbor Healthcare System Institutional Review Boards. We analyzed retrospective data from 5 fiscal years (FYs): October 1, 2008, through September 30, 2013. Two time periods were defined: pre-PACT (October 2008-March 2010) and mid–PACT implementation (April 2010-September 2013). PACT implementation was not uniform across sites and required considerable time, and full PACT rollout was not complete during the study period. Thus, the latter period consisted of ongoing PACT transformation. We included 609 of 797 VHA community-based (located separate from a VHA hospital) outpatient clinics, as well as 155 of 163 VHA hospital-based clinics with at least 500 documented primary care encounters per year (corresponding to VHA’s definition of a primary care site32) and at least 100 veteran patients assigned to clinic PCPs per year, for all study years. Patient assignment data were validated monthly, and assignment dates (begin and end) permitted the determination of a monthly denominator population in each clinic. We used encounter service codes to identify primary care encounters that occurred during in-person (ie, face-to-face) visits by patients assigned to the clinics, regardless of which clinician was seen. An encounter was a documented clinical interaction between a patient and clinician. Although a patient visit may consist of more than 1 clinical encounter, we noted that few visits had multiple documented encounters. We included encounters most commonly designated as primary care, which represented 80.4% of all primary care encounters during the 5 years. We excluded the following other types of primary care encounters: specialty primary care (eg, women’s health [1.5% of encounters], mental health care [2.7%], and geriatric primary care [0.6%]), group appointments (0.5%), home-based primary care (2.3%), and telephone encounters (12.1%). The same electronic health record system was in place during the entire study period. However, there was an evident spike in phone encounters (not included in this study) across all clinicians with the introduction of PACT, as PACT processes facilitated improved documentation of non–face-to-face care. Encounter data included the primary clinician responsible for delivering the encounter. We categorized the identified clinician as a PCP if he or she was a physician, nurse practitioner, physician assistant, or medical resident, as these are the 4 types of clinicians to whom primary care patient panels are assigned in VHA. For lack of an accepted categorical term, we refer to clinicians who did not function as PCPs and were not assigned primary care patient panels, but did provide clinical services directly to patients, as non-PCP clinician members of the care team, which included RNs, clinical nurse specialists (CNSs), licensed practical nurses (LPNs), nursing assistants (NAs) or technicians, clinical pharmacists or pharmacy technicians, social workers, dietitians or nutritionists, and behavioral health clinicians. Although some members of the expanded team may have advanced roles (eg, psychiatrists), our intent was to distinguish between PCPs (ie, primary care clinicians responsible for assigned primary care patient panels) and other types of clinicians whose documented services may fall under primary care encounter codes. We excluded encounters with clinicians other than those listed above (<1.2% of encounters each year) and those missing clinician information (<0.009% of encounters each year). The clinic was the unit of analysis. We compared patient characteristics by type of clinic. Gender and age were available for almost all selected patients; however, race and ethnicity were missing for 17% and 11% of patients, respectively. The percentage of patients who were 65 years and older was calculated for each clinic because these individuals are more likely to have complex medical needs, which may influence workload distribution in clinics. Studies have suggested that small clinics are disadvantaged in their ability to implement PCMH-related practices and are less likely to utilize non-PCPs to perform care activities compared with larger clinics.23,33 Thus, we used the number of assigned patients as an indicator of the size of the clinic. The models included t (time in months), an interaction of time by a PACT indicator (the mid-PACT period; ie, after PACT start), an indicator for community (vs hospital), and the percentage of patients 65 years or older in the clinic. The model included the number of assigned patients each month as the offset denominator for the encounter rates. The generalized estimating equation implemented in the GENMOD procedure in SAS 9.3 (SAS Institute Inc; Cary, North Carolina) was used with an autoregressive correlation structure to account for correlation between time points within clinics. Models additionally specified that clinics were nested within 21 VHA-defined geographic regions. Model diagnostics and changes in coefficients were examined for the presence of potentially influential outliers. The goodness of fit quasi-likelihood under the independence model criterion was used to determine model fit. Review of Current Procedural Terminology codes associated with the encounters indicated that large spikes in RN and LPN encounters in October each year were attributable to immunization administration (most often influenza immunization). Immunizations accounted for 11% of RN encounters and 18% of LPN encounters during the 5 years. Therefore, separate regression models were obtained for the subset of RN and LPN encounters not related to immunizations. Rate ratios (RRs) calculated from the β estimates of time in the negative binomial models compared the expected number of encounters in a month with that of the previous month during the pre-PACT period. Thus, an RR value greater than 1 indicates that the monthly encounter rate increased over time, whereas a value less than 1 indicates the monthly rate decreased, holding other covariates constant. Likewise, a 95% CI that does not include 1 corresponded to evidence that the rate over time was not constant. The β estimates for the time*PACT interaction term compared RRs associated with time during mid–PACT implementation with RRs associated with time pre-PACT; thus, a significant β estimate provides evidence for a difference in the rate of change in encounter rates between the 2 periods. For those clinician types that had a significant time*PACT interaction, the RR for the period of time during PACT implementation was calculated and reported. The assigned veteran population among the 764 clinics increased during the 5 years, from 4.3 million in FY 2009 to 5.2 million in FY 2013 (Table 1). 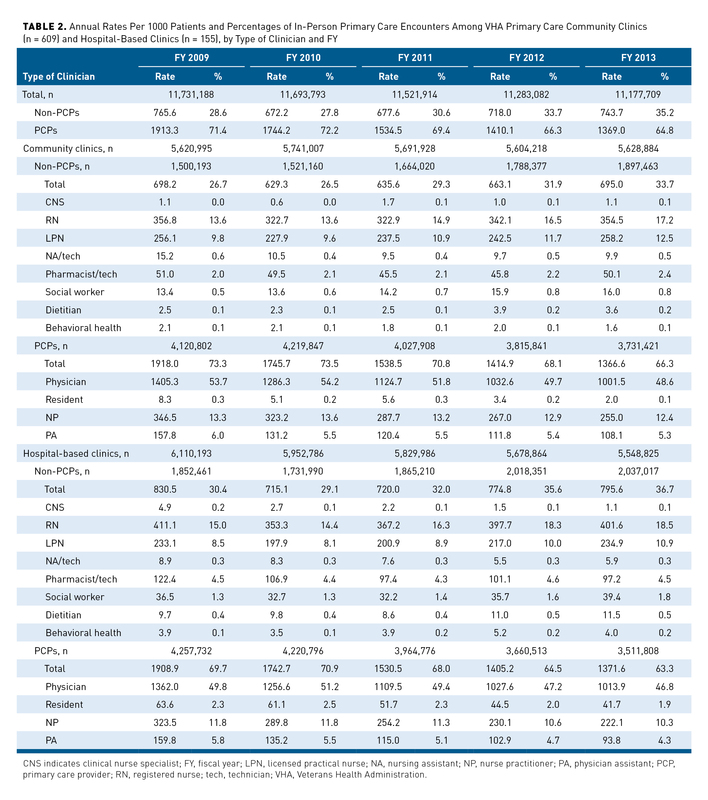 The median number of patients increased by 28%, from 2633 in FY 2009 to 3372 in FY 2013, in community clinics and by 13%, from 13,271 to 14,984, in hospital-based clinics. Patients were primarily male, non-Hispanic, and white. 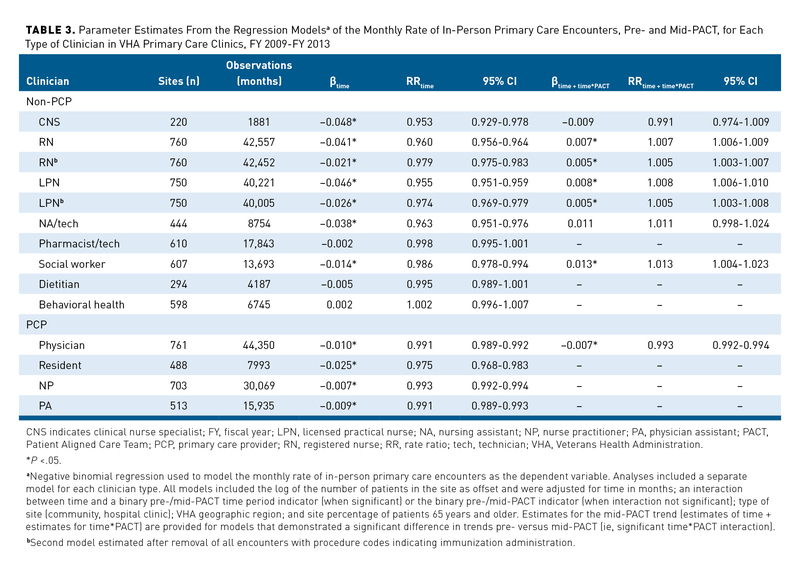 The overall number of primary care encounters decreased during the 5 years (Table 2). 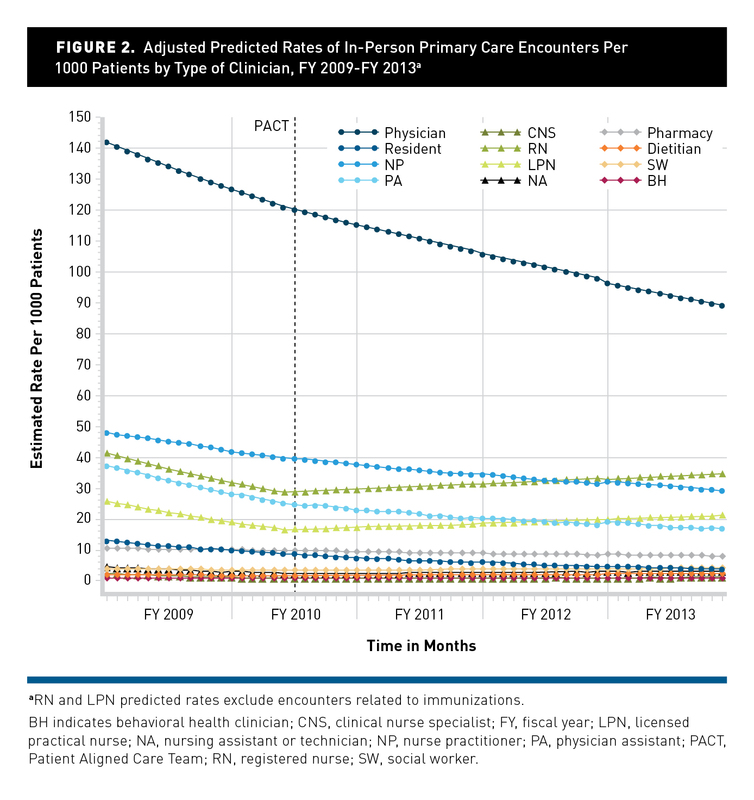 This decline was primarily among PCPs in both community and hospital clinics, whose encounters decreased from 8.4 million in FY 2009 to 7.2 million in FY 2013. Conversely, non-PCP encounters increased from 3.4 million to 3.9 million, representing 29% of all encounters in FY 2009 and 35% in FY 2013. Much of this increase occurred in community clinics, where the number of non-PCP encounters increased by 26%, from 1.5 million in FY 2009 to 1.9 million in FY 2013, compared with a 10% increase from 1.9 million to 2.0 million in hospital clinics. Following an initial drop in FY 2010, encounter rates for RNs and LPNs increased over time, representing 24% of all encounters in FY 2009 and almost 30% in FY 2013. Encounters by social workers and dietitians increased during the 5 years, whereas those by behavioral health clinicians remained relatively stable. Figure 1 displays the distribution of the percentage of non-PCP encounters among all primary care clinics (calculated at the clinic level, rather than across all patient encounters as in Table 2). As a group, the percentage of non-PCP clinician encounters among clinics shifted during the 5 years, representing a larger mean percentage of encounters each year (means, FY 2009, 23.6%; FY 2010, 24.0%; FY 2011, 27.3%; FY 2012, 31.4%; FY 2013, 33.6%). Also apparent is the wide variability among clinics, which was relatively consistent from year to year (SDs, 13.6%, 13.4%, 14.0%, 13.9%, and 13.8%, respectively). In multivariable analyses, we found that the mean predicted monthly encounter rates for each of the 4 types of PCPs significantly decreased over the 5-year period, after controlling for several site characteristics (Table 3). Similarly, encounter rates for several types of non-PCP clinicians, including CNSs, RNs, LPNs, NAs, and social workers, all significantly decreased in the pre-PACT period. However, interacting time with PACT revealed a subsequent significant, although modest, increase in encounter rates for RNs, LPNs, and social workers during the mid-PACT period. After removal of encounters related to immunizations, the RRs for RNs and LPNs continued to show significant increasing rates in encounters during the mid–PACT implementation period, although with slightly less magnitude. For example, the RR for RN encounters mid-PACT was 1.007, which represents a 0.7% increase in the mean predicted monthly rate of encounters per 1000 patients during PACT versus prior to PACT. With the removal of immunization-related encounters, the RR was 1.005, representing a 0.5% increase in the monthly encounter rate. Findings were similar for LPNs. The mean adjusted predicted monthly rates of encounters (excluding immunization-related encounters) obtained from the regression models for each type of clinician are displayed in Figure 2. Although RNs and LPNs experienced decreasing rates pre-PACT, their encounter rates had a slight significant increasing trajectory in the mid-PACT period. The encounter rates for pharmacists, dietitians, and behavioral health clinicians remained stable during the 5 years. However, the monthly rate for social workers significantly increased during the mid-PACT period. Our study found that the percentage of primary care encounters with non-PCP clinicians increased from 29% pre-PACT to 35% mid–PACT (ie, PCMH) implementation, with nurses and social workers experiencing significant increases in their monthly rates of encounters mid-PACT. Conversely, encounter rates of PCPs decreased over time. PACT transformation brought about fundamental changes in team member roles and team functioning.35,36 Nurses have assumed greater responsibility for the coordination, treatment, and management of patient care, with many RNs transitioning to care manager roles.36,37 PACT priorities included expanding access to care and encouraging non-PCP clinicians, especially nurses, to schedule independent encounters with patients. The large hiring of nurses further supported this work. Thus, our findings are consistent with the expectation that core structural and process changes of the care delivery model were under way. In this study, we demonstrated that a simple metric of encounters by clinicians may reflect changes in primary care delivery. Interdisciplinary team-based care is a hallmark of many high-profile efforts to improve models of care delivery. Thus, it is increasingly important to be able to capture the work of all clinicians. Because our focus was on the central issue of whether a metric derived from routinely collected data could detect changes in care delivery, we did not study or report on costs or other outcomes. However, the identification of metrics that account for non-PCP clinician activity in the context of PCMH implementation is foundational to future studies of effectiveness. Redistribution of care tasks from physicians to other types of clinicians is a highly promoted strategy to address increased demand for primary care and primary care physician shortages.3,8,14,15,19,38-40 Prior to PACT, Morgan et al28 estimated that approximately 28% of primary care visits recorded a non-PCP as the primary clinician, which supports our 28.6% pre-PACT estimate of non–PCP-delivered encounters. After the introduction of PACT, Rosland et al found a decreasing trend in PCP visits, similar to our findings, but no significant trends in RN and LPN visits.31 Our current study, however, included an additional year of data and showed a modest yet significant increase in RN, LPN, and social worker encounter rates mid-PACT. The increased focus on team-based care, coupled with the reorganization and hiring of nursing staff over the PACT rollout, may have enabled RNs and LPNs to assume a greater role in care delivery. Findings suggest that as team-based care becomes the norm in primary care settings, approaches for measuring the contributions of non-PCP clinicians are feasible and may be sensitive to a change in care delivery model. Performance measurement has traditionally focused on PCP-related care, including access to care (often measured by a patient’s ability to get an appointment with his or her PCP when needed) and continuity of care (measured by the proportion of total visits that a patient has with his or her PCP). This study, using data from the nation’s largest integrated healthcare system, is an initial step in measuring non–PCP-delivered care using routinely collected data, demonstrating that it may be possible to restructure performance measures to include care provided by team members functioning at a full scope of practice in models of care delivery such as PCMH. Our intent was to provide an initial assessment of primary care delivery across all clinician roles; we did not collect outcome data that would have permitted an evaluation of possible impacts on quality, costs, or patient experience. Relatedly, the optimal proportion or rate of non–PCP-delivered care that provides value, maximizes efficiency, and contributes to good outcomes for patients is not known, but it is certainly a target of future studies. Furthermore, documented encounters are merely 1 source of clinician workload; we did not analyze other meaningful aspects of clinical care, such as alternative modes of care delivery (eg, telephone calls). The available data did not permit determination of whether increases in non-PCP clinician encounters were due to increased workload for non-PCP clinicians, increased numbers and hiring of non-PCP clinicians in clinics, or improved documentation of encounters. Most likely, these all contributed to our findings. Similarly, we recognize that changes in encounter trends may be attributable to contemporaneous factors besides PACT implementation that were not measured in this study. Because we did not ascertain the number of clinicians for each clinic, infrequent encounters for some types of clinicians (eg, dietitians) may simply reflect the absence of a particular clinician in a clinic. We also did not know the number of nonclinical staff in clinics, which may affect clinicians’ workload. Additionally, some non-PCP clinicians (ie, pharmacists, social workers, dietitians, and behavioral health clinicians) may document some of their care activities using service codes not included in these analyses. Finally, the veteran patient population is primarily composed of adult males, which may limit generalizability to the US population. However, our findings are quite relevant to primary care clinics implementing PCMH processes and/or providing care for large numbers of older adults with chronic illness, who tend to be high consumers of primary care. 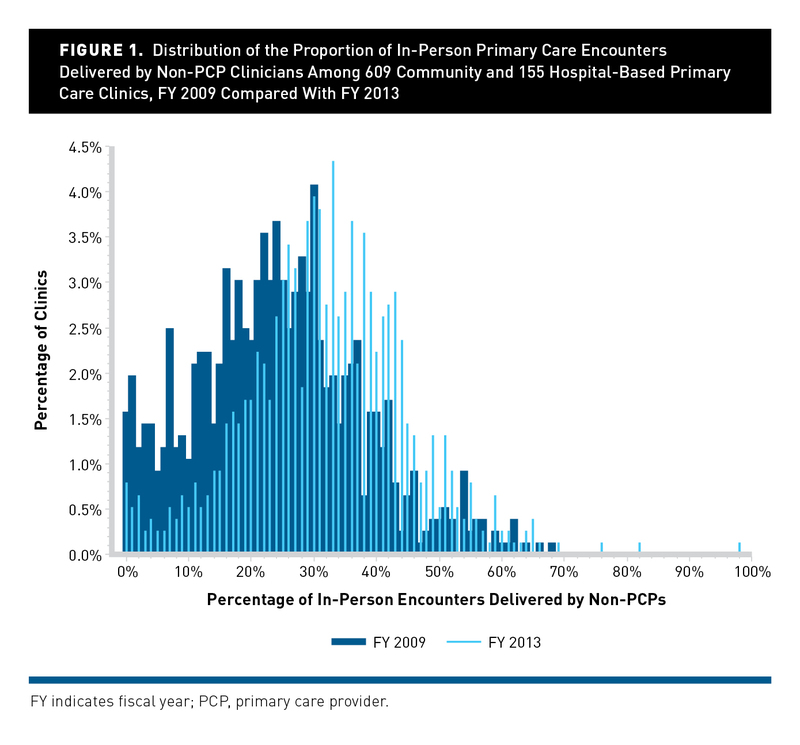 Full utilization of non-PCP clinicians in care delivery expands the supply of clinicians available to patients and is a primary objective of PCMH initiatives. Non-PCP clinicians contribute substantially to care delivery, whether supplementary to or independent of PCPs. As team-based care is increasingly promoted in models of care delivery, it is important that the contributions of all team members are reflected in healthcare policies and measurement approaches. Future work should investigate relationships between measured care activities and attribution of the work of a complete team to quality, costs of care, and patient outcomes. This work was supported by resources and use of facilities at the Center for Clinical Management Research, VA Ann Arbor Healthcare System. Dr Annis was supported by a fellowship from the University of Michigan Rackham Graduate School, by grant number R36HS023517 from the Agency for Healthcare Research and Quality (HHS), and by a VA Advanced Fellowship in Health Services Research through the Office of Academic Affiliations. Dr Rosland was supported by a Veterans Affairs Health Services Research and Development Career Development Award; she is now a research investigator at VA Pittsburgh Center for Health Equity Research and Promotion and associate professor of internal medicine at University of Pittsburgh. Dr Krein is supported by a VA Health Services Research and Development Research Career Scientist Award (RCS 11-222).